McDo's Fifty Thou Araw-Araw ~ Philippine Freebies, Promos, Contests and MORE! 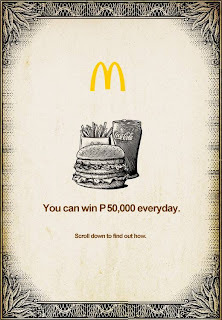 McDonald's is generously giving away thousands of cash prize everyday in their Fifty Thousand Araw-Araw promo. Just by ordering one (1) Extra Value Meal with any Coke product, you will earn one (1) raffle entry which will be your ticket in winning P50,000 cash. Order as many Extra Value Meals as you can per transaction to gain more raffle entries. Rush now to any McDonald's outlet near you. Seems McDo is trying to compete with the ongoing Visa-Jollibee Online Promo. Now what do I choose? Promo Prize: 30 winners of P50,000 cash. 1 winner per day for 30 days.